Mudakkathan keerai (Balloon vine) is known for treating joint pains and cramps. This is also beneficial for arthritis, coughs and colds, menstrual cramps etc. These leaves can easily be grown in homes. ,Mudakku aruththan, in Tamil is pain reliever; pain in joints(mudakku, a type of arthritis) reliever(aruththaan) and hence the name. Recently when I went to Chettipunyam, I saw fresh leaves and bought this keerai in bunches. I made thogayal, chutney, powder and also made dosas. I also dried some leaves and powdered it. This powder can also be used while making dosas. 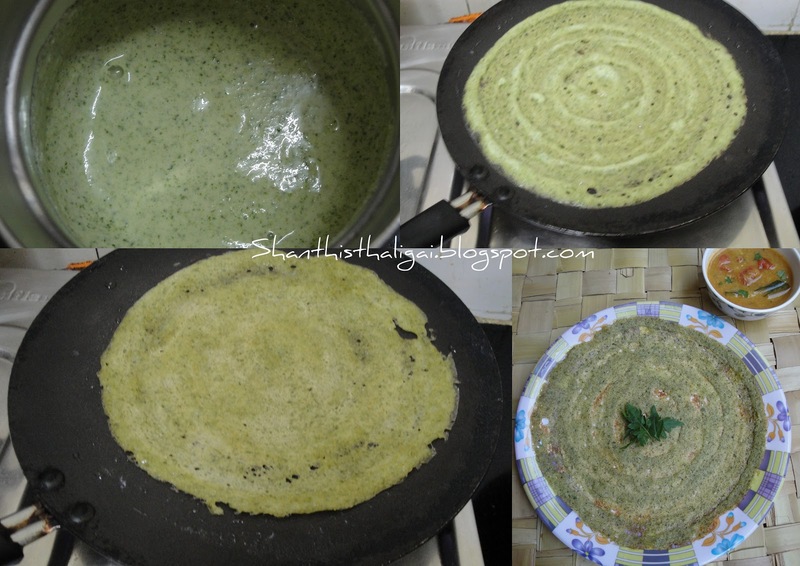 This recipe is an easy method of making Mudakkathan dosai. Wash mudakathan keerai well and take out the leaves. Discard the stems. Grind the leaves alongwith little salt in a mixie to a smooth paste. (Green chillies can also be added. But I did not use). Add very little water if necessary. As the dosa batter has salt in it, add very little salt , only for leaves. Add the ground paste to idli/dosa batter and mix well to get a dosa batter consistency. Heat a dosa tawa, pour a ladle of batter in the centre and spread to a circle. Drizzle oil on sides. Once cooked, flip it to the other side and cook until crisp. Serve hot with sambar or molagapodi or any chutney of your choice. NOTE: Do not preserve the batter in fridge after mixing the mudakkathan paste.